I thought I wasn’t here for about two weeks! Time flies! Maybe my day should have 48 hours instead of 24 😉 Probably it wouldn’t be enough too. Oh my… and now to the point (ekhm) boxed Moms Handmade card! 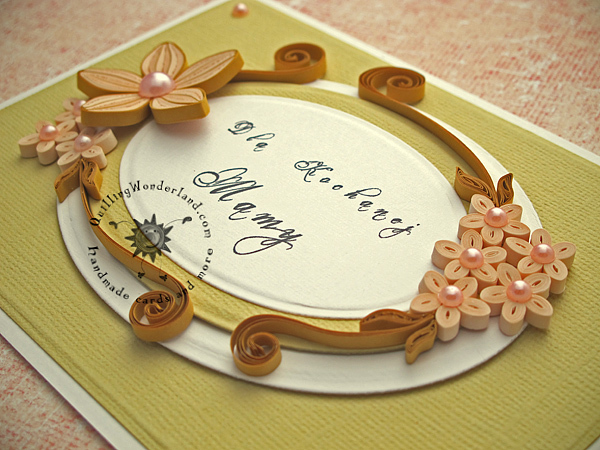 As you probably noticed I started to make more 3D floral cards. I was always afraid of making them… Yes I WAS afraid, but I’m not any more It’s a great fun ( for me of course. You know low flying beads and load of paper strips everywhere 🙂 ). Final result is definitely worth it! This card is made of 3 mm paper strips, but next time I’ll use 1 mm strips. They look much cooler! Ps. Here you can find a tutorial how to make a box for a card. Kolorystyka mnie powala. Trochę beżu, trochę złota. Rewelacja. Nawet jakiś taki łososiowy się tam znalazł 😉 Dzięki wielkie Basiu! Hello, I like your work. Is clean and well done. I wish a good evening! Hello Alberta, that is so nice of you! thank you so much! Have a creative day!